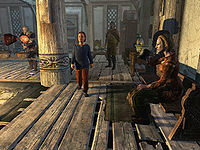 The Battle-Borns are a rich, influential clan in Whiterun who are staunch supporters of the Empire and the Imperial Legion. Before the civil war, the Battle-Borns were old friends with their neighbors, the equally venerable Gray-Manes. However, since the Gray-Manes have sided with the Stormcloaks, the clans are now feuding. House of Clan Battle-Born stands across the street from the Gray-Mane residence. Olfrid is the clan's vocal patriarch. Other Battle-Borns include Alfhild, Bergritte, Idolaf and Jon. Lars is the youngest member, who is usually seen being bullied by fellow child Braith. The Battle-Borns may be involved in the abduction of Thorald Gray-Mane, a strong supporter of the Stormcloaks, by the Thalmor. The Battle-Borns' success is due in part to their owning Battle-Born Farm just outside the city, which is a very lucrative business. The exact relationship to of the different Battle-Borns is somewhat convoluted. Olfrid refers to Idolaf as his son and the creation kit marks him as such, even though Idolaf is married to Olfrid's daughter. Idolaf is also marked as Jon's father, even though all dialogue indicates that Jon is either his brother-in-law or his brother.